Why do So Many People Love Skiing? * Skiing is fun — a change from daily routines and pressures. * Each time you ski there’s a new challenge to meet and a new accomplishment to take pride in. * Skiing puts you in a mountain environment of astonishing beauty. You feel healthy, happy and alive. * Alpine skiing is a very personal experience. You can change the way you ski to match your feelings and the mood of the mountain. * It turns winter into an enjoyable time of the year. * A beginner can enjoy skiing right from the start, experiencing the same challenges and rewards as the accomplished skier. * No two runs are the same because of the infinite variables of mountain terrain, weather, snow conditions and your own feelings. * It’s a great way to meet new friends and for family and friends to grow closer together. * Alpine skiing is an expression of freedom, creativity and independence. * It continually challenges the human spirit. 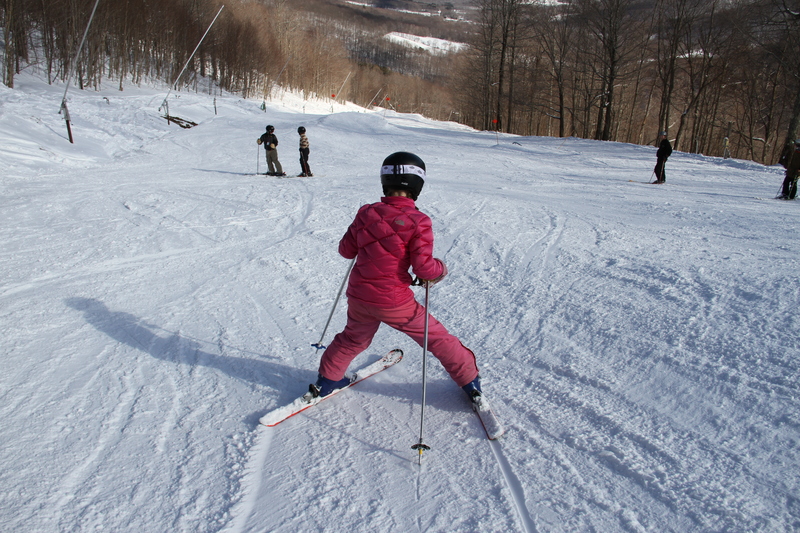 Don’t worry, you are not the only beginner on the slopes! Believe it or not, we have designed our facilities and programs for people just like you. Make sure to look over the Lesson and Trail Map areas of our website. Both will help you get accustomed to where to go and what to do on your first visit. Everyone learns at different paces. It is important to keep your expectations reasonable. This way both you and your children will have a successful and rewarding on the snow experience. Some factors that can affect learning to ski or snowboard include your temperament (how open you are to new things), age, and physical ability. Both skiing and snowboarding take specialized skills that improve with practice over time. Ultimately, your expectation’s for you or your kids should focus on the fun and excitement of the overall experience. Well, no surprise here but clothes that will keep you warm and dry. And that’s really important if you end up falling a couple of times. We do not recommend cotton clothing (jeans and a sweatshirt) it becomes wet, then cold. What’s great is that you probably have most of what you need. If you don’t, just borrow some from friends. The best way to dress for winter is to wear layers. This gives you more flexibility to add or remove layers, depending on the weather and your activity. Turtleneck shirts, sweaters, long underwear and footless tights work well as under-layers. Avoid wearing cotton next to your skin, it will absorb sweat and snow and make you shiver. For that same reason, wool or acrylic socks are better than cotton athletic socks. Wear one, thin pair. Ski and snowboard boots are designed to be warm. Thick socks, or multiple layers of socks, will only give you blisters. If you buy anything, it should be a pair of waterproof shell pants and warm long underwear. You probably have a winter sports jacket already. You may not need as many layers of clothing as you think. On a sunny day, you may only need two layers – the waterproof outer layer and the turtleneck/long underwear first layer. But bring a middle layer (fleece or wool sweater) just in case. You can always take off clothes as you get warmer. In general, the three main layers are wicking (worn next to your skin), insulating (middle layer that keeps the cold out) and weather protection (exterior layer or guard against the elements). * The wicking layer should fit snugly (not tight) next to the skin in order to effectively wick moisture. Comfort is key for the insulating layer. It should be loose enough to trap air between layers, but not so bulky that it restricts movement. Whether you are a skier or snowboarder, your protection layer should fit comfortably, offering you maximum range of motion. * Look for 100 percent UV protection in sunglasses. Make sure the glasses fit snugly behind your ears and rest gently on the bridge of your nose. * Don’t buy gloves or mittens that are too tight. There should be a little air space at the tips of your fingers, which acts as additional insulation. * Don’t wear jeans or street pants. Denim is not waterproof, so water will soak through and you’ll end up cold, wet and miserable. * Cotton is a no-no. Cotton is great for towels, because cotton soaks up and retains moisture. That’s precisely why cotton is all wrong for on-slope apparel. It absorbs moisture (sweat and snow), and retains it. When the wind blows, you will get very, very cold. Don’t wear cotton athletic socks, cotton jeans, cotton sweatshirts, or cotton T-shirts. * Resist the temptation of putting on too many pairs of socks. You’ll restrict circulation and actually cause your feet to get colder. Sunglasses, goggles and sunscreen. The sun can be very strong against a snow-white background. Also, remember to bring water-resistant gloves or mittens and a hat. Future snowboarders, wear wrist guards or knee pads if you have them. They will help cushion your falls.